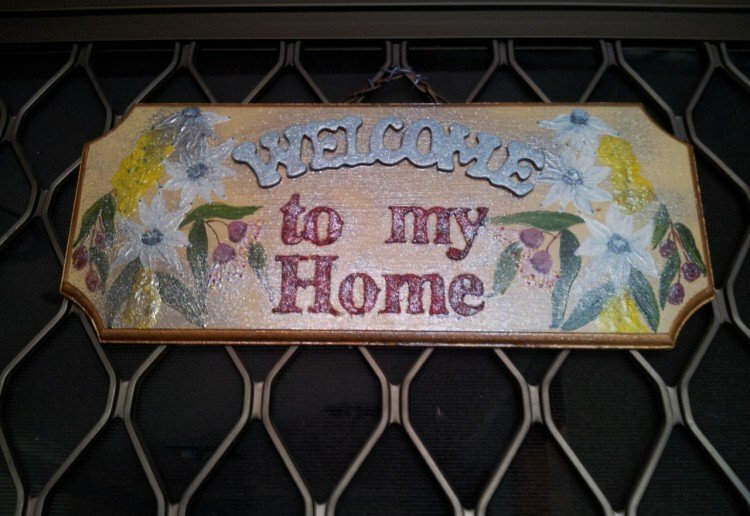 Home | Crafts | Welcome to my Home Plaque. Welcome to my Home Plaque. A cheery and friendly greeting to welcome your visitors. Position your craft letters and glue into plaque. Paint your art work onto plaque. When art work is dry, paint over with a coat of estapol. When estapol is dry, give a quick spay with glitter hair spray. Let dry. Attach hooks and chain to back of plaque and your ready to hang. Ahh to be so artistic. Love your work. Thanks for showing us how. A beautiful plaque to welcome guests! Thanks so much! Beautiful! Will have to make one for my home, and the kids can help! Will be a precious keepsake. Thanks for sharing! Thanks for sharing – we made one of these years ago and it lasted for ages. It was fun to be reminded. A brilliant idea! Thanks for sharing! Brilliant idea! It looks really great! Thanks so much for sharing! Nice and sweet. well decorated. Great job. I’m not enough of an artist though.